Radiculitis is a term used to describe neurological symptoms of a compressed, inflamed, or pinched nerve. Radiculitis can affect any nerve that travels through the spine, but it most commonly affects the lower back and neck. Radiculitis treatment options will often depend on the source of the pain and underlying condition. How Do You Know if you Have Radiculitis? Radiculitis symptoms are similar to those of having a nerve injury or pinched nerve. The pain will vary based on the location of the affected nerve. Cervical radiculitis will affect the upper extremities while thoracic radiculitis will affect the mid-back; lumbar radiculitis, which is more common, will affect the lower extremities. Some of the symptoms associated with radiculitis include muscle weakness, pain, numbness and tingling radiating down through the back and into the arms, hands, legs or feet. Along with the symptoms of radiculitis, a complete medical examination and imaging studies, such as an x-ray, can help find the source of the radiating pain. An MRI with a dye injection (called an MRI with contrast) may be used to visualize the soft tissue, spinal cord, and exiting nerve roots. Seeking treatment for radiculitis should not be delayed. Depending on the severity, certain muscles (e.g. muscles in the toes, feet, and calves) may begin muscle atrophy over time, which, in turn, may require physical therapy for recovery. Also, radiculitis is known to cause patients to “favor” certain muscles or a certain side of their body, which can result in the overdevelopment of those muscles relative to the ones that don’t get used as much. Physical therapy as part of lumbar radiculitis treatment will involve passive and active modalities. This type of therapy may include hot/cold therapy, electrical stimulation, specific exercises for strengthening the back and stretches. Heat or cold therapy will involve the use of cold and/or hot packs. Heat therapy works by dilating the blood muscles of the vessels around the spine. The process increases the flow of oxygen and nutrients to the muscles to stimulate healing. Heat also stimulates the sensory receptors, which decreases the pain signals to the brain, partially relieving your discomfort. Finally, heat stretches the soft tissues around the spine, increasing flexibility and overall comfort. Cold therapy can relieve pain, swelling and inflammation. Ice massage and ice application is generally most helpful following an injury that strains the back muscles. Over-the-counter and prescribed pain medication, such as anti-inflammatory medications, can help decrease inflammation, decrease muscle spasms, and overall, just provide pain relief. Acetaminophen, muscle relaxers, and opiate pain relievers may be prescribed. While physical therapy can include exercise, some patients may also be given a regimen to follow. Low impact aerobic exercising such as cycling, walking, and swimming can help ease some of the pain. Massage therapy can provide pain relief for those suffering from low back pain. A skilled massage therapist can provide the right amount of pressure to ensure pain relief, but not agitate the problem. Massage therapy works by isolating and rejuvenating the back muscles. It can help with muscle tension and inflammation, muscle spasms, and back stiffness. When the pain is severe or does not respond to conventional radiculitis treatment, such as rest, analgesics, anti-inflammatories, muscle relaxants or physical therapy, or the pain is due to failed back surgery syndrome, surgical procedures may be required. Using local anesthetic, our experienced spinal surgeons insert specially designed instruments directly over the affected area. 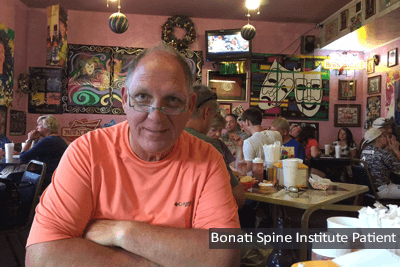 The patented Bonati Spine Procedures are done in an outpatient setting and do not require a hospital stay. Benefits of the Bonati Spine Procedures include rapid recovery to a normal lifestyle, local anesthesia, minimal blood loss, minimal damage to tissues, a small incision and fewer risks and complications compared to traditional open surgery and spinal fusions. If the underlying cause of radiculitis is a herniated disc or bulging disc, a discectomy can be completed. The procedure involves removing the herniated disc material that is constricting the nerve roots of the spinal cord. Part of the nucleus pulposus, the center of an intervertebral disc, will be removed. A foraminotomy/foraminectomy relieves nerve pressure by opening the neural foramina, the small spacing in between the vertebrae where the nerve roots exit the spinal canal. Many conditions, such as spinal stenosis, spondylolisthesis, or a thickening of the ligaments can cause the neural foramina to narrow. Debridement is the surgical removal of torn, inflamed, contaminated, damaged or dead tissue. Debridement may be completed in the lumbar, thoracic or cervical spine. Laser debridement involves using a laser to obliterate the tissue. The Bonati Spine Institute encourages patients with radiculitis to contact us to request a no-obligation MRI review or discuss your conditions with our medical professionals. Find out why The Bonati Spine Procedures are considered to be among the world’s best solutions when it comes to advanced spine surgery. Your pain from spinal stenosis can become a thing of the past.